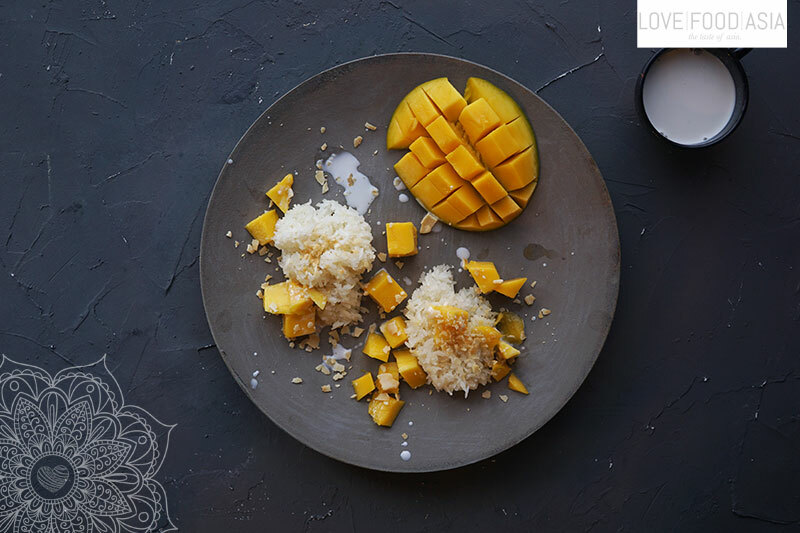 Thai Sticky Rice with Mango (Khao Niaow Ma Muang) | Love.Food.Asia. We always remember the moments in Thailand when we had Khao Niaow Ma Muang. We ate it in South-, Central- and North Thailand. And it was always a special moment. If you ever visit Thailand Mango Sticky Rice (Thai: Khao Niaow Ma Muang) is a meal you shouldn´t miss. This delicious dessert is simple, sweet, fresh and fills you up. Our version of Khao Niaow Ma Muang is a bit differnet than the original Thai recipe but it is even more delicious. In the beginning you have to soak the rice in cold water for at least two hours. Place Sticky Rice in a bamboo steamer and steam it for 20 minutes. If you don’t have a bamboo steamer you can use a pasta pot as well. Meanwhile heat coconut milk in a small pot on low heat. Now add salt and palm sugar and mix well. Dice fresh mango. Serve Sticky Rice on a plate with coconut milk. Place fruit dice on top of the rice. Scatter coconut flakes on top and serve it when rice and coconut milk are warm.